Movie fans enjoy superstar team ups. People get excited when superstars join together to make a big film such as when Sylvester Stallone and Kurt Russell became Tango and Cash. There’s also a demand for famous characters to share the screen as experienced in Alien vs. Predator. 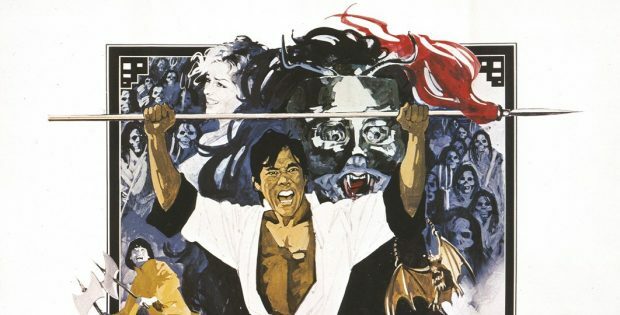 In 1974 fans of horror and kung fu were given a treat when two studio came together to share their specialties in one big feature. While founded in the ’30s, England’s Hammer Studio had been synonymous with horror with their Dracula and Frankenstein series since the late ’50s. Shaw Brothers had been the dominate martial arts studio in Hong Kong since the mid-20s. At the height of the ’70s drive-in culture, they bonded to create The Legend of the 7 Golden Vampires (or The 7 Brothers Meet Dracula in the USA). Dracula gets unexpected visitor at his castle in Transylvania. Kah, a monk, has traveled all the way from China to seek assistance from the Prince of Darkness (The Vampire Lovers‘ John Forbes-Robertson). Turns out the monk oversees the Temple of the Seven Golden Vampires and the Asian bloodsuckers are losing their power. Dracula must come East to restore them to their glory. But Dracula can’t leave his castle. Although he can make the journey if he takes possession of Kah’s body. The monk doesn’t go willingly. What he doesn’t know is that Professor Van Helsing (Star Wars‘ Peter Cushing) is already in China. He gives a lecture about vampires in Asia including the Seven Golden Vampires only to be dismissed by most of the students. Luckily Hsi Ching (Five Shaolin Masters‘ David Chiang) not only believes him, he knows it is real. He helps Van Helsing put together a team to head deep into the countryside and stop the vampire menace that besides local fighters includes Van Helsing’s son (Pacific Banana’s Robin Stewart) and a rich widow (On Her Majesty’s Secret Service‘s Julie Edge). But they have no clue that Van Helsing’s nemesis is lurking behind the Golden Vampires. The Legend of the 7 Golden Vampires allows both companies to provide their strengths to the production. Hammer brings the vampire lore and Peter Cushing to the screen. The Shaw Brothers amp up the action scenes with huge kung fu fighting. Things don’t seem as awkward in this cultural mixing as both sides respect each other’s turf. Director Roy Ward Baker (Quatermass and the Pit & Scars of DraculaThe One-Armed Swordsman) handle the the Shaw Brothers aspect of the film. Sadly Cheh did not get to share screen credits. Cheh directed 8 films in 1974 so he was probably too busy to notice. Why didn’t Christopher Lee play Dracula? Around this time he was too busy shooting at James Bond in The Man With the Golden Gun. Sadly this would be Peter Cushing’s last Hammer film. The studio was losing steam and would only produce two more movies until it’s 21st Century revival. Cushing looks dashing on the screen since he doesn’t have to fight the beaver pelt they slapped on his head for Frankenstein and the Monster From Hell. For those curious, Cushing does not bust out the Bruce Lee moves. He’s still an Englishman in his fighting style. The Legend of the 7 Golden Vampires is a fun merger of the Kings of Eastern and Western cinema with kung fu fighting and bloodletting galore. The video is 2.35:1 anamorphic. The transfer brings out so much detail compared to previous releases. The clarity makes it much more entertaining. The audio is DTS-HD MA Mono. The levels are fine even though a lot of the dialogue was created during ADR. The movie is subtitled in English. Audio Commentary features film historian Bruce G Hallenback. He wrote the book Hammer Vampires so he knows about their bloodsucking legacy. He points out how Hammer and the Shaw Brothers wanted just the 7 Golden Vampires. Distributor Warner Brothers insisted on Dracula appearing. The 7 Brothers Meet Dracula (74:57) is the version of the film when Dynamite Entertainment distributed it in America instead of Warner Brothers. This isn’t just the usual clip job. Dynamite repeated scenes from the film and used optical effects. It’s a strange restructuring. Interview with David Chaing (6:38) is a clip from a bigger documentary on the actor. He speaks about the influence Peter Cushing had on his approach to acting in films. TV Spot (0:31) is black belt meets black magic. They give away the ending of the film. The Legend of the 7 Golden Vampires Trailer (2:54) links the film to Enter the Dragon. They mention the mixing of Hammer and the Shaw Brothers in the tease. Still Gallery (6:26) includes posters, lobby cards, promo photos and newspaper ads including when it played at a drive-in with two faux-Bruce Lee flicks. Where was the Sherwood Drive In? They also double billed with Master of the Flying Guillotine! Scream Factory presents The Legend of the 7 Golden Vampires. Directed by Roy Ward Baker. Screenplay by: Don Houghton. Starring: Peter Cushing, John Forbes-Robertson, David Chiang, Robin Stewart & Julie Ege. Rated: R. Running Time: 89 minutes. Released: April 9, 2019.